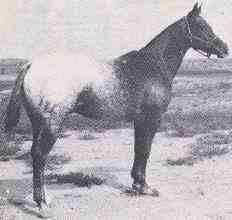 Apache King S. set world records at 500 yards, 770 yards, 880 yards, four furlongs, 4 1/2 furlongs and five furlongs. 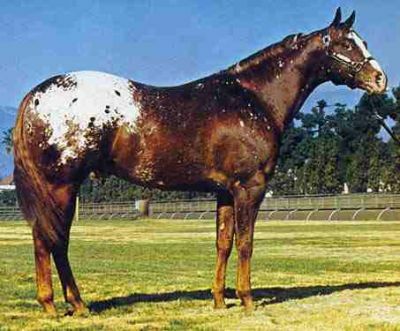 In 1963, he claimed the aged-stallion racing championship for dollars earned. 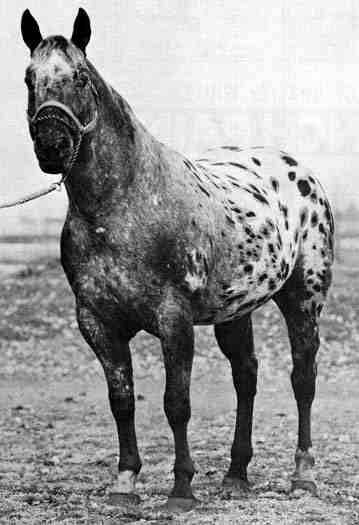 Michelle Berg`s Apache King S. article in the January 2000 Appaloosa Journal reported that with 20 starts, Apache King S. earned 16 wins with seven stakes wins. 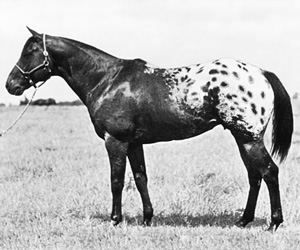 While a June 1970 Appaloosa News article by Bob Szarek reported that of a total of 36 starts in seven years of racing, Apache King S. compiled a record of 28 wins, 6 place and 2 show -- never out of the money. Those larger figures probably include races not reported to or recorded by ApHC. 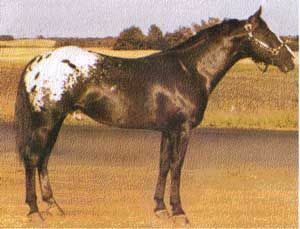 Apache King S. sired 93 registered foals. His get include 38 starters and 16 winners who garnered a collective $31,057.75 at the track. 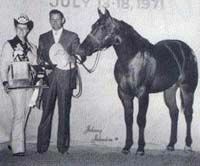 Apache King S. received the leading-sire title in 1967 and 1968 for producing the most winners. 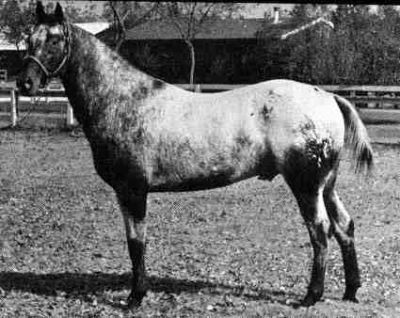 Daiquiri-Bar, a daughter of Apache King S., made an impact on the halter and performance world, earning a bronze medallion in halter and won the 1987 leading dam of medallion winners title. Apache King S. died on April 5, 1970, of liver failure. 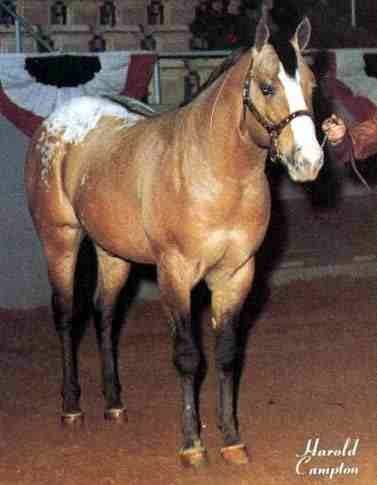 Apache King S. was inducted into the ApHC Racing Hall of Fame for the year 1988. 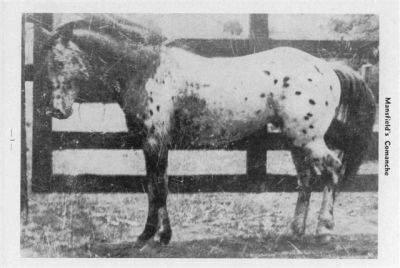 The all time leading sire of Appaloosa foals, with 703 on record including 25 World Champs by the time he reached 9 years of age. Sired 30 performance point earners with 537.5 points, 36 halter point earners with 279 points, 15 ROMs earners, 2 Superior Performance Horses. Sire of 181 foals with 283 performance points, 358 halter points, 3 Bronze Medallions, 13 ROMs, 1 Club Champion and 1 Versatility Champion. Can. Natl Ch. Get of Sire and Halter Champion. 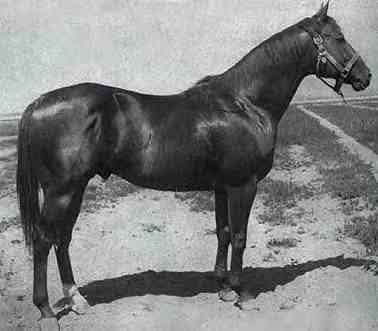 Mighty Bright was shown in halter three times as a weanling, winning at all three events. 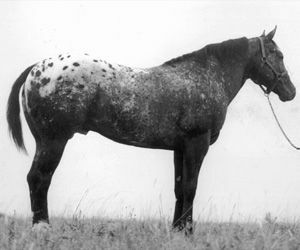 At the end of the show season that year, he received the Mountain and Plains Appaloosa Association High Point Weanling award. 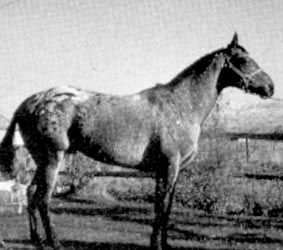 The beginning of Mighty Bright’s 1961 show season proved disastrous when the yearling was involved in an accident prior the Denver National Western Stock Show. Mighty Bright sustained an injury that ended his show career. 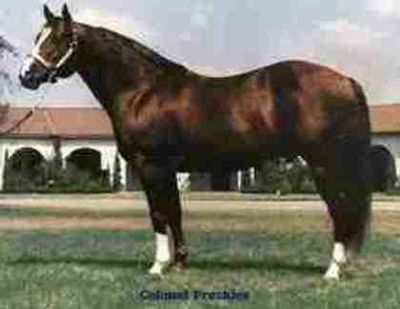 He was the first GEAR Premier Sire. 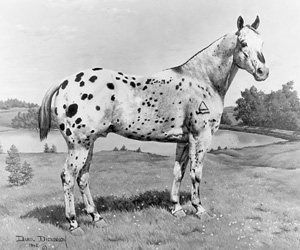 He was range-raised and his mark was not recorded in the show ring, but rather displayed by the outstanding horses who continued his bloodline. inducted into the Aphc Hall of Fame in 1988 as well. with spotted blanket to neck, bald face. 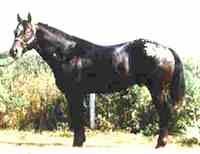 Sire of World & National Halter & Perf. Champions. ApHC Hall of Fame. GRAND CHAMPION Fort Worth, San Antonio and Houston. ApHC Hall of Fame 1989; National Cutting Horse; ROM Sr. 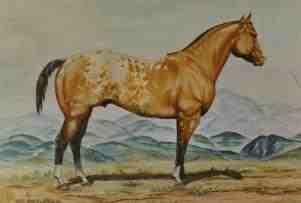 The leading sire of racing Quarter Horses for many years. American Quarter Horse Hall of Fame 1989. Died April 6, 1968. 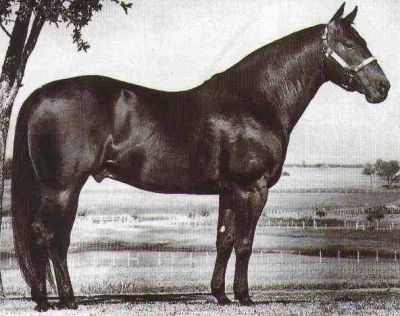 Three Bars was the sire of 29 AQHA Champions, 4 AQHA Supreme Champions, 317 Racing Register of Merit earners, and his foals earned more than $3 million. 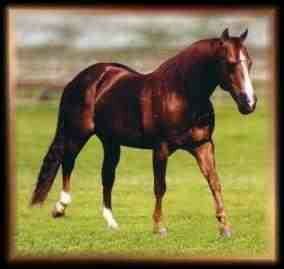 Sire of AQHA Chs/ROM Arena/Pro.Dghts/etc. 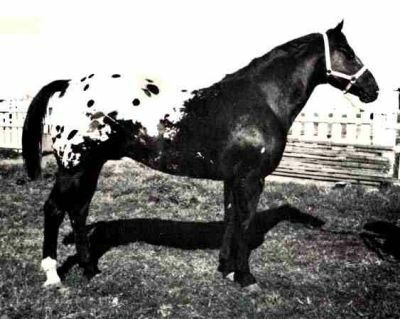 He was grand champion stallion at Denvers National Western Stock Show, the Southwestern Exposition and Fat Stock Show in Fort Worth, State Fair of Texas in Dallas and the American Royal Livestock Show in Kansas City. 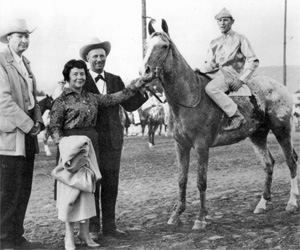 As a 4-year-old, in 1948, Poco Bueno started his performance career as a cutting horse, and his amazing ability helped him to quickly acquire an impressive record - and a legion of fans. 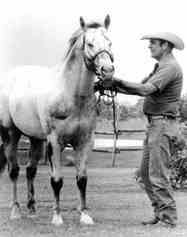 He was the first quarter horse to be insured for $100,000.00. 972 foals - 417 perf. 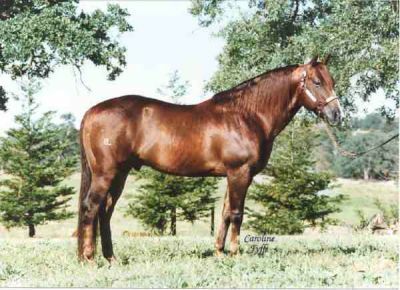 Sire of AQHA World Champion, 2 AQHA Res World Chs. 9 AQHA Superior Perf, 66 AQHA Arena ROM. Sire of NRHA Money earners ($123,092) and A Leading Maternal Grandsire NRHA Money Earners, incl Futurity Chs and Finalists. Sire of NCHA Money earners ($3,721,256) incl Futurity Chs and Finalists. A Leading Sire and Maternal Grandsire NCHA Money Earners. A Leading Sire and Maternal Grandsire NRCHA Money Earners. Died in October 1986 of Colitis X due to ingestion of blister beetles. 147 total pt-earners with a total of 3,149 points All Divisions combined. A Leading Sire NCHA money earners. 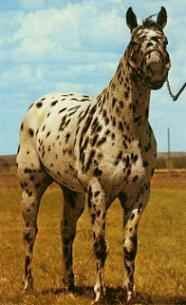 A Leading Maternal Grandsire NCHA Money Earners. 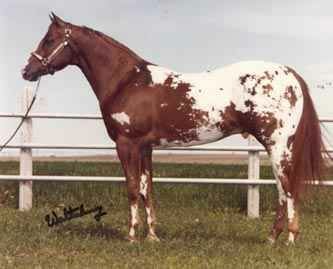 Sire of Multiple NCHA Hall Of Fame. Doc O Lena is currently #7 NCHA producing sire. He has produced $15,022,589.00 in NCHA. 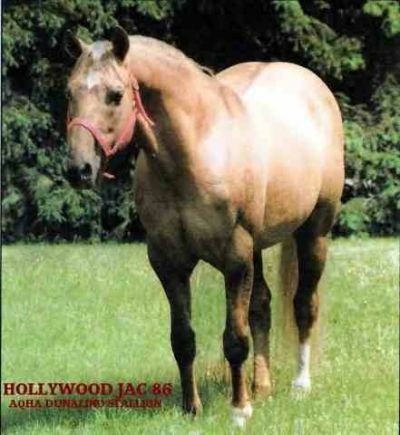 1981 AQHA World Champion Open Jr. Reining. 1980 NRHA Futurity Open Champion. 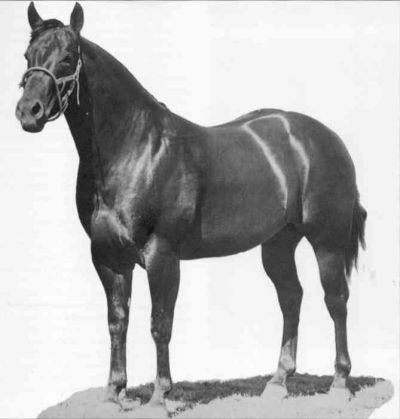 Sire of Topsails Rien Maker LTE $243,737; 2008/2009 Worlds Greatest Horseman Champion. 2008 Worlds Richest Stock Horse Champion.2007 Worlds Richest Stock Horse 3rd. 2007 NRCHA Reserve Open Champion Bridle Horse at the Derby. 2007 Worlds Greatest Horseman Finalist.2007 Magnificent 7 Reserve Champion.2005 NRCHA World Champion Open Hackamore Champion. 2004 NRCHA Open Derby 3rd. 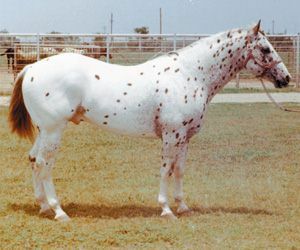 2002 Snaffle Bit Futurity Ltd Open Reserve Champion. 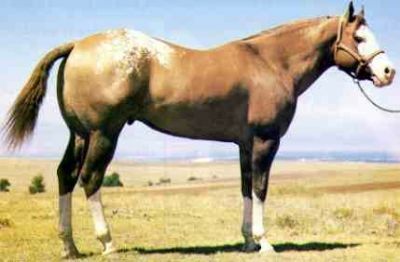 2003 NRCHA Open Hackamore National Reserve Champion. 2004 Open Qualified Jr. Working Cow Horse World Show. AQHA (14) Open Performance points. 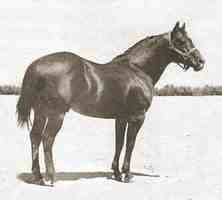 SIRE OF: TOPSAIL WHIZ NRHA Earnings $90,000.